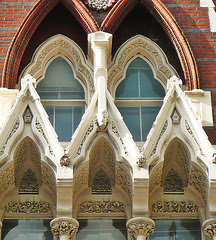 This Saturday 2 April 2016 we hope you can join us for our first easy going 'architecture' ride of 2016 when we will be looking at London buildings in the Victorian Gothic style. Victorian Gothic, which pursued its fervent course from the 1840s to the 1880s, was a movement which claimed to be divinely inspired, to be the only truly moral form of architecture possible if the Anglican Church and the soul of Britain were to be rescued from terminal decay. Like the modernists of the twentieth century, its polemicists boasted that this one style would bring about a purer, more bracing world. The result - a blizzard of spires, spikes, soaring pointed arches, buttresses, multicoloured brickwork and delirious medieval decoration. We'll look at banks, houses, palaces, churches, railway stations, offices and hospitals, all strenously aspiring. Ride Saturday 2 April 2016 - Meet on the Albert Embankment riverside footpath, SE1: between St Thomas's Hospital and the river, directly opposite the centre of the Houses of Parliament, at 10.30am for a 10.45 start. No need to book - just turn up. Please ensure your bike is roadworthy. There will be a pub lunch and the ride will finish c4.00pm near Oxford Street.